Shedding some light on the Home Owner Builders Exam in British Columbia. The BC Housing-Licensing & Consumer Services – Home Owner Builders Exam for Owners wanting to build their new home within British Columbia. 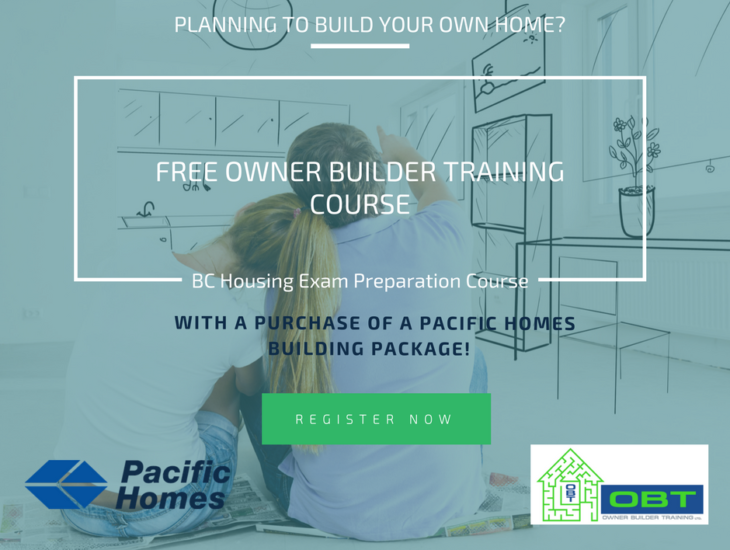 The Homeowner Builder will want to go to the https://www.bchousing.org/licensing-consumer-services/owner-builder/ section to start learning about the current steps, fees and requirements to become an Owner Builder of their new family home. One of the new hurdles a person wanting to build their own personal home will run up against, is the newly required Owner Builder Exam https://www.bchousing.org/licensing-consumer-services/owner-builder/owner-builder-exam This subject is definitely creating quite a buzz and also a growing list of very upset people just wanting to build their own home. I have even heard rumors of a class action suit to be filed… This requirement came into effect July 4 2016, so of course there was a flurry of Owner Builders applying for a building permit before this requirement change, so it seems there hasn’t been much activity in this segment of construction for some months following July 4th. Now we are starting to see this area picking up again with new projects coming in and clients heading off to take this 90 minute 100 question exam. I’m getting feedback that the Owner Builders aren’t getting any guidance and are feeling they are being told to basically study and memorize numerous building topics but we are only going to ask you 100 questions, which could be on anything within this very large amount of information. This exam was, from what I can see, to be implemented to make sure Home Owner Builders had a better grasp on what is required to be the general contractor of their new home project. One would think this is a good concept but when it was rolled out last July there was very little known about what the test would include. There was no study guide issued or a course that homeowners could attend to learn the most important aspects that one could learn. I think this type of outline should have been implemented well before the exam requirement was brought into effect. At this point in time it would almost seem that the program designed to help educate and protect the Owner Builder is actually penalizing them and not empowering them as it should. I believe any true Home Owner Builder would jump at the opportunity to take a weekend course or something similar before they embark on their building project. This program should be set up to help educate and empower the Owner Builders that truly want to build their own home. I can understand from the HPO’s side that they want to curb activity where the Home Owner was just permitting the project then essentially handing it off to a contractor to look after the whole project for them as this is not the true picture of a home owner really wanting to build their own home. By adding this step I think it definitely would curb that type of activity. With the right study guide and course, the applicants would feel confident entering into taking the exam. This would be a very acceptable step while truly benefitting the Owner Builders in the process. In the end, the home owner doesn’t have to put on a tool belt at all and can hire a professional for every single aspect of his project but he must be managing the project and working with these professionals/contractors, building department and inspectors and this is what the program should be encouraging and assisting with regards to Homeowner Builders truly building their own homes. It almost seems currently that this program is working more like a scare tactic rather than making sure the Owner Builders have been screened properly to make sure they are building their own home, and then educated to complete their project. From my experience working with clients building their own homes they are consistently going above and beyond what is required by our BC Building Code because this is their own home and they take great pride in what they are creating. From my research, it also seems that there are now some courses popping up in different areas that are put on by third party companies offering the information needed to cover with regards to the exam. BCIT has more in depth courses one could look into if desired. While talking to people that have written the exam and researching this subject I have come across some very interesting stories, topics, blogs, videos etc. I will paste a number of these website links below that one should check out if you are thinking of applying as an Owner Builder and writing the exam. I will also note a few other comments from clients that I have heard which may answer some of your questions on this topic. Do you want to Build Your Own Home? We can help! We have recently partnered with OBT – Owner Builder Training to offer the Owner Builder Authorization Exam Preparation Course to those who want to personally build their own home. This course will allow participants to enhance their knowledge about the Homeowner Protection Act and Regulation, as well as all of the steps required to understand how to build a home. With a purchase of a Pacific Homes Package we will reimburse you the $799 for the cost of the course. Our first course will be offered on March 6th and 7th at our main office in Cobble Hill, BC. To sign up please visit the attached link below, fill out the form below, call 604-626-8373 or email warren@ownerbuildertraining.com. Ken & others – from start to finish it was a pleasure dealing with you as individuals and as companies. We are in awe of your skills, professionalism and hard work. We extend our thanks to your staff and colleagues. You made this experience a highlight in our lives and one to remember for a very long time. Ken – We have been in the house for 6 months now, and are loving it. The house is very energy efficient indeed. Just wanted to let you know how much Lori and I appreciate your help and patience guiding us thru this project. We are very impressed with the quality of the house and the quality of your Pacific Homes reps here in Fairbanks. Once again, thank you for a job well done. We were very happy with our Pacific Homes building experience and our representative Scott. Scott went above and beyond to make sure he understood what we wanted and delivered on time with a great product. Any (minor) problems we had were dealt with promptly and courteously. Great product and great service, would use them again in a heartbeat! Thanks Paul! We are finally in this incredible house, it’s absolutely lovely. Our sincere thanks for the fabulous work, products, and excellent customer relations. It truly was a pleasure, every time, right through the process. Everyone who sees or enters our home is amazed by the building quality, view and interior. I am amazed myself. The design of the home complements its surroundings and takes full advantage of the view and sun. Ray – Overall a great experience dealing with Pacific Homes. It made my first home building project enjoyable and as easy as possible. Dear Paul – almost a year now and the house is meeting all expectations. We’re very happy with all aspects; job well done! Join our newsletter and stay up-to-date with the latest industry innovations and what’s new at Pacific Homes. Drop us a line for more information on how we can make your dream home a reality. Contact one of our staff for a no-commitment estimate on your dream home. Copyright © 2019 Pacific Homes. ALL RIGHTS RESERVED.